Take the lettuce leaf challenge! Now that the weather is (supposed to be) getting warmer, thoughts turn to salad rather than hearty, warming soups. However, it breaks my heart having to buy lettuce, especially when I know my own will be ready to start eating next month. I was looking at the price of bagged lettuce in the supermarket. Prices range from 80p to £2.00. I go through a couple of bags a week so if I spend an average of £3 per week on lettuce from April to September, that works out about £72! Now I have never had much success growing whole lettuce, whether it be cos, little gem, iceberg or butterhead. However, lettuce leaves of the “cut and come again” variety, thrive. I believe even the most neglectful gardener would find it hard to kill them off! You don’t even need a garden to do this. For less than £10 you can have an endless supply of lettuce leaves on your windowsill, at your back door or in your greenhouse, all summer long. All you need are some pots, some multi-purpose compost, crocs for drainage and a selection of seeds. 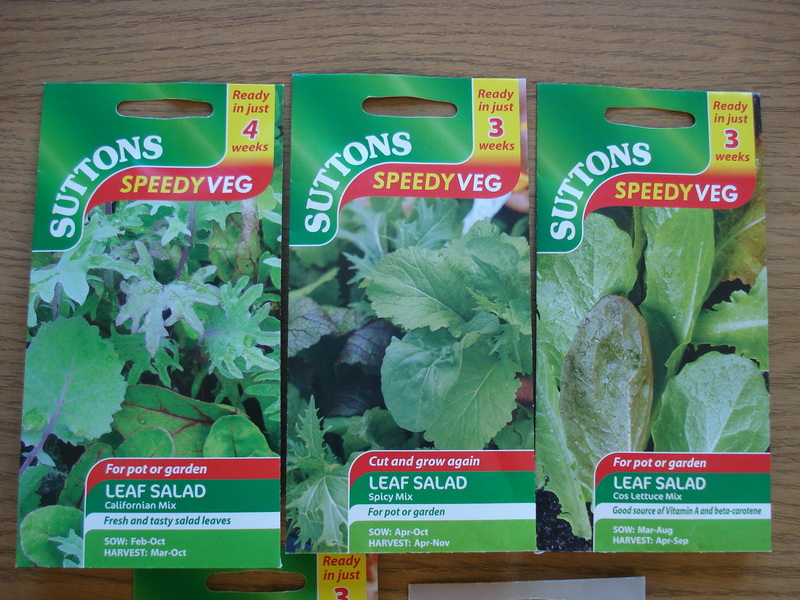 "speedy veg" - ready in 3 weeks! 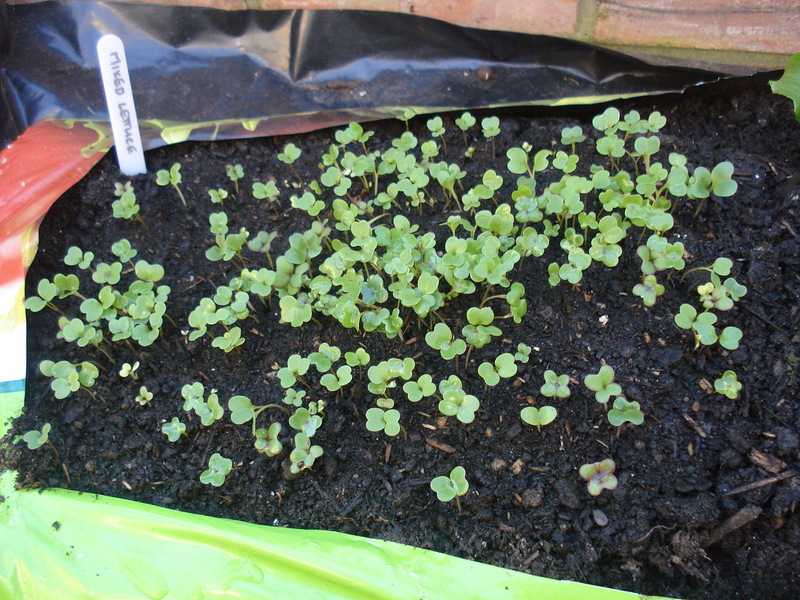 as 3 weeks, some rocket, spinach and perhaps lollo rosso for some colour. Make sure each packet of seeds contains around 500-1000 so it will last all summer. Put some crocs (broken crockery or gravel) in the bottom of a pot and fill it with compost. Next, I get an egg cup and open each packet of seeds. Pour a little from each packet into the egg cup, mix together, then sprinkle over the surface of the compost, cover lightly with some more compost and water in. In 3 to 4 weeks you can start picking and eating the leaves. The “cut and come again” type should last a few weeks so every 2 or 3 weeks sow another pot and by the time the first one is finished you will have a new pot all ready to tuck into. I have used one side of a small growbag. These are the seeds I started last week. In a couple of weeks I'll sow some more in the other half of the growbag. Keep the pots in a bright sunny place close to the kitchen. Keep the compost moist, never let it dry out. Keep a look out for slugs and snails. Sow little and often . Think of what you can buy with the money you’ll save! This entry was posted in Vegetables and tagged food, gardening, lettuce. Bookmark the permalink. I know! I get so sad when my mom and sister buy storebought lettuce in the dead of winter (the one time of year we don’t have any in the garden) and pay so much for something so tasteless! When they could just wait a couple of months and snack on such delicious greens. I agree that leaf lettuce is a cinch to grow. As long as it’s outside. I tried to grow it indoors once, because I had no outdoors in one apartment, but that really doesn’t work, even in a nice sunny south-facing window. The lettuce needs a lot of light to develop well. And I think it needs the wind, too, to beef up the leaves and make the midribs crisp. Anyway, like your ideas for growing outdoors in pots. Everyone SHOULD try it! Thanks. When you consider the cost of shop-bought and how easy it is, it’s a no-brainer really!